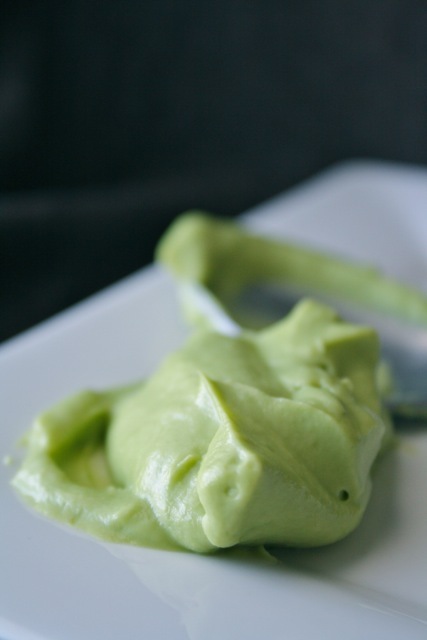 The Traveling Spoon: Avocado 'Mayonnaise' (or Egg-Free, Vegan Mayonnaise) - the perfect condiment for Memorial Day cookouts! 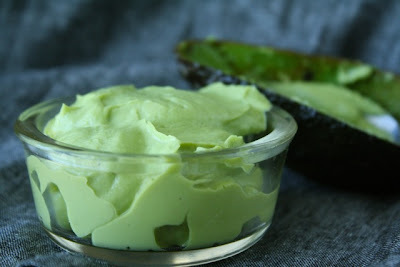 Avocado 'Mayonnaise' (or Egg-Free, Vegan Mayonnaise) - the perfect condiment for Memorial Day cookouts! Matt and I are now firmly entering into the preparation stages for our upcoming move. It's exciting (our first time in a real place - with spare rooms, stairs, and a real lawn!) and a little stressful (we'll be packing and moving everything ourselves) but let's be honest, it hasn't really left me a lot of time for blogging. Thank goodness, then, that today's recipe is ultra-short and super-simple. In fact, it only has two ingredients, but don't let that fool you, it's big on taste and a perfect accompaniment to all those juicy burgers - of the beef, veggie, or portobello variety - that you'll be grilling for Memorial Day this weekend! Avocado 'mayonnaise' may sound a little unusual, but it's a great, natural alternative to the regular kind - filled with healthier fats and also perfectly appropriate for vegans. The flavor is surprisingly similar - especially when spread on burgers or in sandwiches. It's also great with Mexican food, and if you're a bit skeptical, you can think of it like extra smooth and creamy guacamole! I happened upon this tasty condiment when I was preparing some super-ripe avocados for freezing - you'll notice that the preparation method is almost identical, which also means that you can make a big batch and freeze the leftovers without any issues (they'll keep in the fridge for a couple of days, but anything beyond that and I recommend freezing). Whether you're not a fan of regular mayonnaise, just sick of buying it, or want to try out a new use for avocados, give this 'mayonnaise' a try - you won't be disappointed. 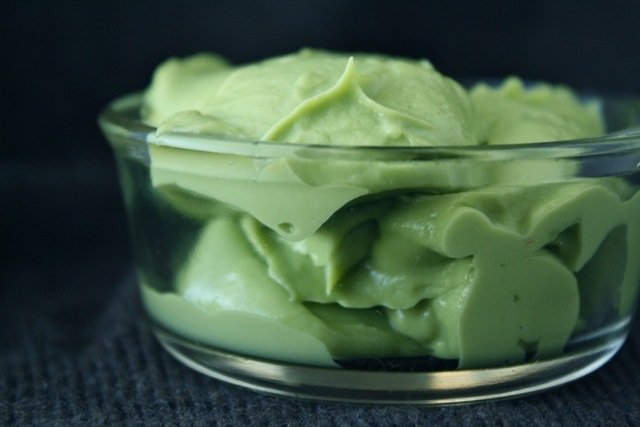 In a blender (I use my mock Magic Bullet) blend avocado flesh until smooth and creamy. Add 1 Tablespoon of lime or lemon juice (lime is recommended) for each avocado blended. Blend again until mixture is light and smooth - it should be somewhat frothy. Add salt to taste. Keep refrigerated until ready to use. Enjoy as you would regular mayonnaise - on sandwiches or burgers, or as a condiment for mexican food, pasta, or baked potatoes. Store leftovers in an airtight container in the refrigerator for up to 3 days, or frozen for up to 3 months. mmm, I love avocado, especially now because it's so cheap around here! I'll be trying! I miss you friend! I miss you, too. We need to get together! Mmmm! Perfect sandwich filling! Looking forward to trying this. What a great idea, I can't wait to try your Avocado Mayo, it looks great! Hope you have a great holiday week end and thanks so much for sharing with Full Plate Thursday. I hope you like it, too. If you like avocado, there's no reason you shouldn't since it's without all the add-ins that guac usually has (and has a bit of a smoother texture). Thanks for the good wishes - our weekend's been great, even if we have spent it packing boxes! I can't believe how simple this is! I am definitely going to try...it's great that it can be frozen too! I know - it really can't get any easier! Hope you like it! This looks great. My 2 year old loves avocados and would love this on sandwiches! Thanks! YUM! Can't wait to try this. Pinning!